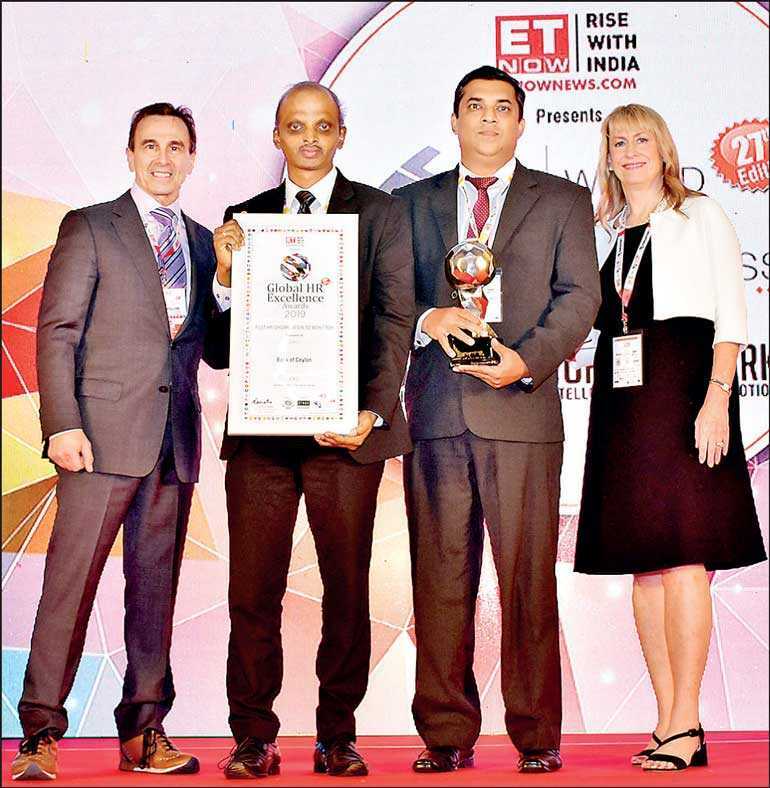 The World HRD Congress once again recognised the Bank of Ceylon as one of the ‘Best HR Organizations to Work for’ at the 27th edition of the annual Global HR Excellence Awards held for the year 2019 which took place at Taj Lands End, Mumbai, India in February 2019. This was the second consecutive year the bank was recognised for its best practices in the field of Human Resources. The event was organised to encourage HR practitioners who are organised for a professional cause benchmarking best HR practices. The Bank’s Assistant General Manager Human Resource Damma Wijayawardene and the Chief Manager Superannuation Samantha Wimalasiri received the award from Reina A Trust Building Consultancy Co-Founders Dr. Michelle Reina and Dr. Dennis Reina. The Bank believes its Human Resources are the key element behind its success. The Bank’s HR policy ensures that it maintains a culture of contribution and innovation at work; consistently improving the HR Policy by measuring organisational health and inculcating values that help to achieve its vision; being a Social Employer and developing future leaders in the organisation. This award recognises the efforts the Bank has made for effectively managing a workforce of over 9,000 and driving them to reach the Bank’s strategic goals and maintaining itself as the No. 1 Bank in the country. “The Bank considers its team of employees as one of its greatest strengths. Every effort is being made to ensure the well-being of staff. The attrition rate, which is below 1%, is one of the lowest in the industry, which speaks volumes of the bank’s HR management processes. Right from the start of their careers, all new recruits are provided with an induction training so that they can easily blend into the culture and work ethics of the Bank,” stated Deputy General Manager Human Resource K.E.D. Sumanasiri. The Bank of Ceylon was also recognised as one of the ‘Best Employer Brands 2017’ and the ‘Best Bank in the Public sector’ at the Banking and Finance services Industry (BFSI) excellence and leadership Awards 2017, at an event hosted by the World HRD Congress in 2017, citing criteria such as leadership and vision, Inspiration and Engagement, Commitment and Delivery, Future Orientation, integrity and ethics and ability to sustain. Brand ‘BOC’ was conferred the title ‘Asia’s Best Employer Brand for 2016’ endorsed by the Employer Brand Institute, World HRD Congress. It also won the silver award at the People Development Awards 2016/17 conducted by the Sri Lanka Institute of Training and Development (SLITAD). The award was in recognition of the bank’s continuous endeavour to train and develop its human resources to ensure an efficient banking service to the nation. The Bank has a Training and Development Policy which identifies the development needs of each and every employee and provides training in the required areas for their development. Its main objective is to identify and conduct training and development programs based on the business requirements. The bank has allocated a significant annual training budget to cover these training programs to ensure their quality and the effectiveness of those. Investment in training and development is done with the intention of enhancing and updating the job related knowledge of employees, thus helping them to provide a better service to customers and perform their duties more efficiently, while also developing their knowledge and fulfilling their career aspirations.